It's time to learn how to cook quinoa, a beloved grain (although technically it's a seed!). Here we teach you how to shop for and prep it, cooking techniques, and flavors that match perfectly. I'd like to show you how easy cooking quinoa is; it's bound to become your new favorite grain. Honestly, I've never met a person who doesn't like it because it's just SO tasty! Well known as the ancient grain of the Incas, we're so lucky to have this grain on our beautiful Earth to savor. It's light and yummy, and easy to fall in love with at first bite. What The H-E-Double-Toothpicks Is Quinoa?! Quinoa (pronounced KEEN-wa) is gluten-free so it's perfect for those trying to avoid gluten, like Celiacs. It cooks up like a fluffy couscous except that each grain sports a distinctive tiny white filament. Quinoa is best when it retains a slight crunch. Cooked too long or in too much water, it turns to mush. But don't worry, I'll teach you how to avoid mushy quinoa below. Quinoa's nutritional profile is amazing -- high in complete protein, high in calcium, and containing silicon and magnesium which are needed in order for your body to make use of calcium. Brilliant. Plus, it's an alkaline grain, which helps to balance off the mostly acidic diet many of us have. But it's important that you learn to prepare it correctly for optimum flavor. That's because it has a bitter coating called saponin that is believed to be a natural insect repellant. So let's get started learning how to select, clean, cook and flavor your quinoa to perfection. To begin with, always try to choose organic quinoa. Organics tend to contain more nutrients and less pesticides (and other poisons like arsenic! 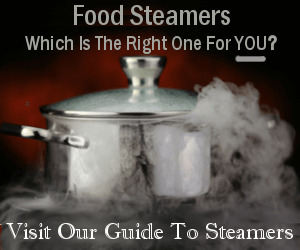 ), and will help your recipes just taste better. Quinoa can be found in most natural foods stores, and some mainstream grocery stores. 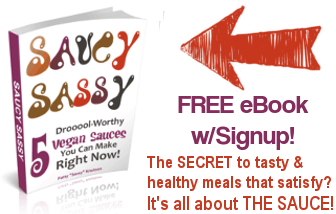 It can be found pre-packaged, or in the bulk section of your health food store. Packaged quinoa tends to be cleaner than that bought in bulk, although that shouldn't dissuade you from buying bulk quinoa, which means less packaging for our landfills. Buy a little more than you need, storing the rest in the refrigerator or freezer. There are many different varieties, ranging from dark brown to nearly white. 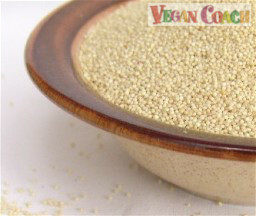 The large white variety is most readily available, and that's good because it's considered to have the greatest nutrient content and taste -- this is the quinoa I prefer to use. As mentioned, quinoa contains a natural bitter coating (to keep bugs away) that needs to be rinsed off before cooking or your recipes could have a bitter flavor. Now, for years I just rinsed or toasted my quinoa before cooking it. Nowadays, I pre-soak all grains. Why? Because it helps to make them more digestible so your body can take up the nutrients inside. I'll leave it to you to decide which you'd prefer. If you have the time I recommend pre-soaking your quinoa in 3-4 times the amount of water overnight, or at least 6 hours. Then just drain, rinse, and cook. The cooking times found throughout our site are based on pre-soaked quinoa unless noted otherwise. Please note, pre-soaking your quinoa makes a huge difference to the length of time it will take for your quinoa to cook. In other words, it cooks much more quickly than unsoaked. Or, if you prefer to just give it a rinse, add the quinoa to a FINE MESH strainer. (The strainer must be fine because grain is so teeny tiny it would slip through the holes of most strainers or colanders.) Hold under running water. Be sure to do this step just before cooking, or it will throw your cooking times off. Another way to get rid of that natural bitter coating is to toast in a dry pan. Again, this is only if you don't pre-soak. There is no need to toast first if your quinoa is pre-soaked. 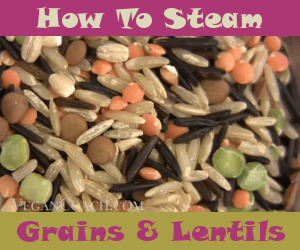 You'll Love This Video Showing You How To Cook Quinoa and Other Grains! 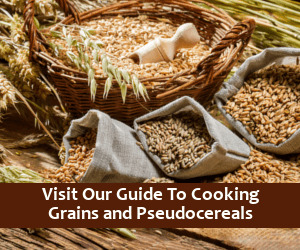 The other grains shown in the video can be found throughout our website and include brown rice, wild rice, buckwheat, millet and barley. When you're ready, let's continue our discussion about yummy Quinoa. Here are the cooking techniques we use and recommend for quinoa. "What are those little white strings that appear when I cook my quinoa? Are they supposed to be there?" Create your very own quinoa recipes with some of your favorite ingredients from this list of foods that match perfectly with quinoa. Quinoa can be made with either vegetable stock or water. Use veggie stock if you plan to serve quinoa as a substitute for rice. Switch to water if using it as the base for a cold salad that will be seasoned with a vinaigrette so the flavors don't compete.